When growing top-quality cannabis, you need the best possible cannabis soil to produce healthy plants. Good soil health results in good cannabis health. You can’t cut corners in this area. Simply stated, you need to buy the best to produce the best. What you invest in essential growing material will more than pay off in the long run once you harvest. In the cannabis space, many commercial growers use hydroponic growing practices for mass production, using a variety of fertilizers, but in the private sector, organic soil mixes and soil additives reign supreme. While both methods can produce outstanding cannabis, the organic approach gets the nod for coaxing the optimum terpene experience from the plant. Quite a few discriminating cannabis enthusiasts swear they can taste a synthetic fertilizer a mile away if it’s ever been used on the cannabis they consume. Soil cultivation requires sound growing practices and diligent observation during every step of the veg and flower stages, as well as a thorough flush prior to harvest. Cannabis that is grown and flushed properly, using organic soil cultivation, is arguably the finest available to those who want the very best. 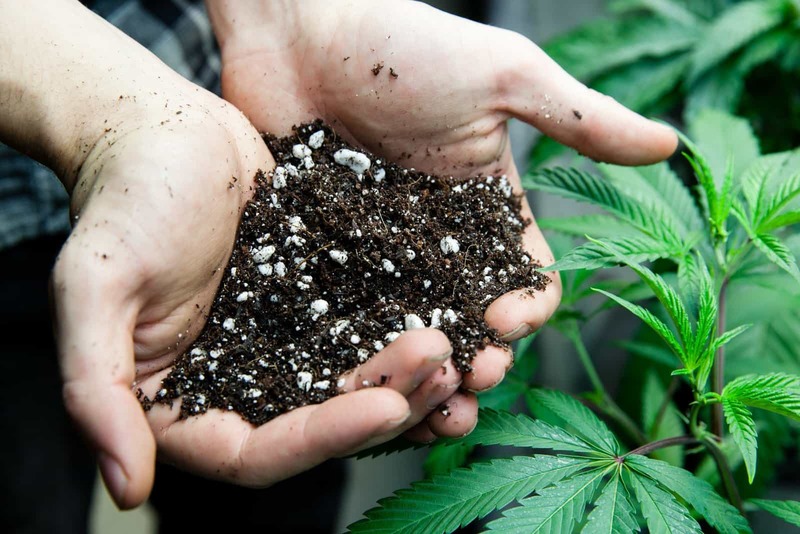 Several commercial soil and fertilizer companies sell their own prepared organic soil mixes that are ideal for cannabis cultivation. This eliminated much of the work necessary in the early stages of plant growth, although supplemental soil additives will be necessary once the organic fertilizers in the soil are used up by the rapidly growing plants. Bat guano, kelp, fishmeal, and earthworm castings are common components of high-quality organic soil mixes. Companies such as Fox Farms—a company that has served the needs of cannabis growers and other gardeners for many years—sells a range of organic soils and additives. Fox Farms’ Ocean Forest and Happy Fog organic mixes both work well. Some commercial organic soils have adjusted pH levels. You can find the full range of Fox Farms soil mixes here. Roots Organic is another excellent mix for cannabis. It’s available from several nurseries, and this mix contains plenty of ingredients that will make your marijuana plants happy and keep their roots well aerated. Containing pumice, peat moss, coco fiber, perlite, bat guano, earthworm castings, fish bone meal, kelp meal, alfalfa meal, soybean meal, and Virginia forest compost, your plants will thrive in this growing medium, and it is so rich in nutrients you won’t have to provide any additives for the first three weeks or so. If you want to create your own cannabis soil and don’t have access to compost, your best bet is starting with a good-quality basic potting soil—sans pre-mixed fertilizers. To this, you can add perlite, coco fiber, and other ingredients to create your own personal mix (be sure to do your research and combine ingredients at the recommended ratios). You will be able to provide your own additives, from a variety of sources, to grow quick, lush plants. If you’re able to create your own compost, by all means do so. This organic and nutrient-packed approach will pay dividends when harvest time arrives. Adding compost to outside grows is easy since you merely put it at the base of the plants, on top of the soil in which it grows. Nutrients will trickle down when plants are watered. Indoors, small amounts can be added to potted plants. To make compost, you will need a large wired-in space to put your compost pile. Geographical areas with warm and mild climates will yield the best results. You start by combining brown compost material (dead leaves, dry grasses, etc.) to lesser amounts of green compost material (grass clippings, overly ripe fruit, zucchini and carrot skins, etc.). The compost will require regular mixing. Some people use compost tumblers to store their compost and make the mixing process easier. Several websites and online videos can help you master the composting process. Fox Farms’ Big Bloom bottled formula is a great soil additive that’s organic, promotes growth, and keeps plants lush and healthy. Used in combination with Grow Big and Tiger Bloom, you will provide your plants with an almost completely organic (as organic as you can get from a bottle) growing regimen. Fox Farms and other companies will also provide a schedule for feeding the plants these additives; Big Bloom, Grow Big, and Tiger Bloom are fed in various combinations and quantities of the growth cycles, since cannabis has different nutritional needs during different stages of growth. Plants want nitrogen in the vegetative stage, and less nitrogen and more phosphorus during the flowering stage. Cannabis also enjoys a soil that’s very slightly acidic, thus appreciating a bit more fungus in the bacteria-to-fungus ratio than some other soils. Most experienced growers agree that the required dosages on the labels of these products are a bit high, so they feed at one half to three quarters of that amount with outstanding results. For those looking for a vegan alternative to conventional organic fertilizers, Vegamatrix is an interesting option. Free from all animal-sourced organic ingredients so common in organic cultivation—bat guano, earthworm castings, fish meal, and bone meal—not to mention the numerous animal proteins found in compost, Vegamatrix has a wide range of bottled products to make cannabis plants thrive. As well as being organic, these products are free of heavy metals and GMO plant-based materials. Vegamatrix Grow, Bloom, and Boost nutrients work to maximize plant growth and production during the veg and flower stages of its life. Amp It, Prime Zyme, Hard-N-Quick. and Big-N-Sticky are other products that can optimize your grow. If you use a high-quality soil mix like the ones mentioned above, your soil pH will most likely be just fine, and your grow will proceed without a hitch. Prepared soils and additives—especially those favored for cannabis—will almost ensure your grow will proceed without nutrient issues. For those creating their own cannabis soil, especially soil containing compost, you may want to periodically check your pH levels, particularly if you sense there might be a nutrient-related problem. Some feeding adjustments should solve the problem. To make sure your soil is prepared for optimum cannabis growing, you’ll want to check the pH. Your soil pH should range between 5.8 to 6.5—with 6.0 being about perfect. Soil pH test kits are widely available and will tell you a variety of things about your cannabis soil. The tests vary a bit, so choose one that will meet your needs the best. Soil health is an important consideration when growing cannabis. Fortunately, a wide variety of soils deliver optimum cannabis production. All you need to do is follow some simple guidelines and choose which one you want to use!